Katherine, tell us about your series. Is this book a standalone or do readers need to read the series in order? 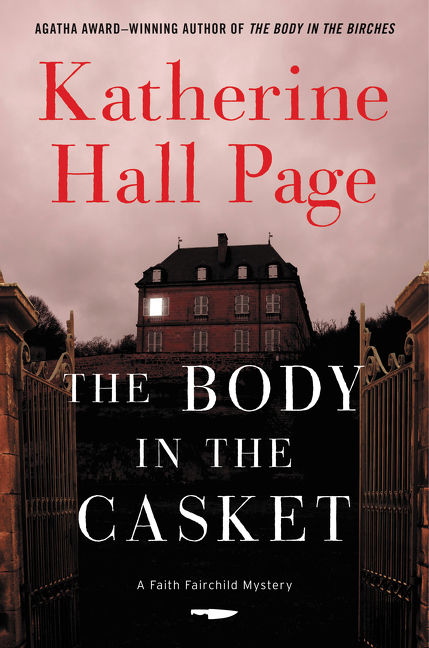 I have been fortunate to write a long running series starting with The Body in the Belfry (1990) and now #24, The Body in the Casket, all in print. I had no idea that I was writing a series when I wrote the first book, but as soon as it appeared there would be a few more I realized I needed to make each one work as a stand alone. Reading in order is a matter of temperament, but not a necessity! 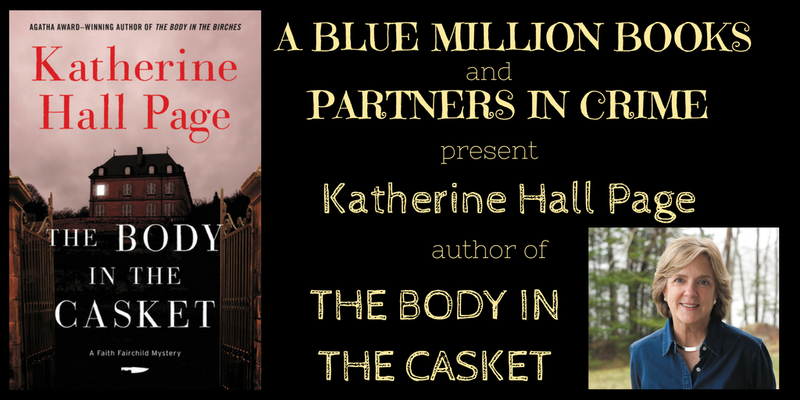 My amateur sleuth is Faith Sibley Fairchild who grew up in the Big Apple, but falls in love, marries and finds herself in Aleford, a small town west of Boston. Her husband is the Reverend Thomas Fairchild. Daughter and granddaughter of clergy, she had vowed to avoid the fishbowl existence of a parish, but the heart knows no reason. In the first book she has her infant son in a Snugli when she stumbles across the still warm body of a parishioner in the town’s old belfry and rings the bell setting off a chain of events and characters that continue in spirit throughout the books. She left her highly successful Manhattan catering firm, “Have Faith” when she moved, but starts it up again in Aleford. Along the way she has another child, daughter Amy. I didn’t get the memo about not putting kids in murder mysteries. Motherhood seemed to go with my character, but childcare can become difficult when pursuing a hot lead! I live in two small towns, one twenty minutes west of Boston and not unlike the completely fictitious town of Aleford. I am surrounded by woods and very nice people. The other town is on an island in Penobscot Bay, Maine fortunately connected to the mainland by a lovely suspension bridge. I am surrounded by water and very nice people. I grew up in Livingston, New Jersey about forty minutes from Manhattan. When we first moved there in the 1950s, it was a farm community. That continued for a while—there was a 4H Club in my high school. But the post war baby boom changed things—over 500 in my graduating class—and the farms were covered by malls and housing. It was, however, a wonderful place in which to grow up. I’m a Jersey Girl—and no, I don’t pump gas. That as I grown older, a lot of the baggage I’ve carried around would become lighter and even fall by the wayside. Was conned during a sales call into one of those “free” vacations—NYC—in return for listening to a brief sales pitch about vacation condominiums. If it sounds too good to be true it is. We went on the “vacation” during which the pitch went on for hours, increasingly aggressive and splinters under my nails would have been a relief. That much of the time would be veiled by the mists of time—and that my braces would eventually come off! My friends and family, specifically my husband of 42 years and our son. Nothing will ever equal the joy we felt when baby Nicholas was placed in our arms. I tear up thinking about it now 34 years later. On another note, I am made quite happy by chilled, not cold good champagne and tasty nibbles. Aside from noir mysteries—when I read, I am right there in the book—I am frightened about what the future hold for my son, his cohort, and the next generation because of climate change in particular. We saw the effects in Maine this summer on the fishing industry that was down because of warming waters. I have had two (so far) great careers. My writing job started in the late 1980s and before that I was a secondary school teacher and administrator. The last 5 years I was the head of a program within a public school for teens with special emotional needs due to chronic truancy, difficult family situations and substance abuse. It was rewarding and exhausting. I miss the classroom, and I miss those kids. My husband and I were fixed up, although we did not know it at the time. Mutual friends invited us to dinner, a rather large party. It wasn’t love at first sight, but definitely second as he left to do research in Canada immediately after for some weeks and I pretty much forgot him. Not his wonderful deep voice though—he’s from the Bronx—when he got in touch upon his return. The friends reminded him to call, although he says he didn’t need it. We went out the following night. And here we are. Taking family and the cat—Samantha, the daughter I never had—as givens, I would take one of my mother’s paintings. She was a professional painter and one large one, an abstract landscape she titled “Winter Light” is my favorite. She gave it to me for a significant birthday. It was one she never wanted to sell, and she knew I loved it. Miss my parents every day. This is very easy. “Bad Taste Leads to Crime” (Le Mauvais Gout Mène Crime) from the Baron Adolphe De Mareste (1784-1867). Definitely words by which we all should live! “She tried her best.” This is actually on a woman’s tombstone from the 1800s in a Deer Isle, Maine cemetery. I have always wanted to write a traditional country house murder in the spirit of many of Agatha Christie’s set in such places. Hercule Poirot was introduced in The Mysterious Affair at Styles, a quintessential country manor house. I have also always had a passion for the theater, especially Broadway musicals. Growing up not far from New York City, this was an important part of my life and my parents had friends in that world. I wanted to draw on those experiences. Faith is catering a weekend long 70th birthday party that legendary Broadway producer Max Dane is throwing for himself. The twist is that all the guests were connected in some way with Max’s only failure: Heaven or Hell The Musical twenty years ago. He hasn’t produced anything since, retreating to his isolated large mansion not too far from Faith’s Massachusetts home. Giving her a tour of the house and interrupting her menu suggestions, he tells her that although he is sure she is a fine chef, he has hired her for her sleuthing abilities. A macabre early birthday gift convinced him that one of the invitees wants to kill him. Before long the two elements became one. Broadway meets Havencrest (Max’s house) equals murder. I enjoy research, and for this book I read a number of theatrical biographies, specifically ones about the Broadway producers David Merrick and Hal Prince. I also went back to some of my favorite movies: The Wrong Box (1966), Sleuth (1972 version), Deathtrap (1982), Clue (1985), and especially Murder By Death (1976). These also explain why Max Dane and Michael Caine became one in my imagination. Dorothy Cannell, Neil Gaiman, Charlaine Harris, Roger Lathbury, and Gregory Maguire. Again, this is very easy. Being interrupted. Even by my near and dear. There had better be a good reason—fire etc. I started out writing when the school bus came to pick my son up and stopping when it dropped him off with breaks for housework and even a walk. All these years later it’s still what works for me. I don’t write on weekends if at all possible. And I take more walks now. I have dedicated offices (small) in both my houses now, which is heaven. “She gave me all the clues and I should have guessed the murderer!” Hear it with happy frequency. The 25th in the series—Silver Anniversary—The Body in the Wake, working title. Katherine Hall Page is the author of twenty-three previous Faith Fairchild mysteries. 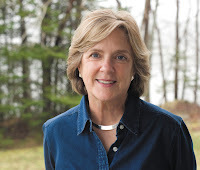 The recipient of Malice Domestic’s Lifetime Achievement Award, she has received Agathas for best first mystery (The Body in the Belfry), best novel (The Body in the Snowdrift), and best short story, (“The Would-Be Widower”). She has also been nominated for the Edgar, the Mary Higgins Clark, the Macavity, and the Maine Literary Award. She lives in Massachusetts and Maine with her husband. Excellent collection of unusual stories!! !